Think back to a time when you ate something that was “world famous”. Something like Geno’s cheesesteaks, Hofbrauhaus beer, or Gatlin’s BBQ in Houston. The tagline for these foods is usually something along the lines of, “the best ice cream in the world” or “the greatest cheeseburger this side of the Mississippi.” Now ask yourself, was that food you ate with the lofty tagline, REALLY the greatest!? I’ve been fortunate to have the opportunity to travel a good bit and partake in many cities “greatest” foods, but rarely does that food actually live up to its billing. With that said, on two magical occasions, the food was the best I’ve ever had. My former business partner came back from a trip to Memphis and literally wouldn’t shut up about Gus’ Fried Chicken. On my next trip to Memphis I didn’t have time to hit Gus’, but then my flight home was cancelled (after pulling away from the gate) and I had to spend another night there. Trying to make the best out of the situation, I thought I would give Gus’ a try and see if my buddy was right. Approaching the door to the restaurant, the sign out front says, “Gus’ World Famous Fried Chicken.” Gus ain’t playing around with a statement like that. The chicken was without a doubt the best I’ve ever had. If Gus doesn’t have a champion belt, someone needs to get on that. The chicken was glazed in honey and melts in your mouth. It’s so good, I nearly ordered another serving. I had the better sense than to eat too much of a good thing, but that chicken is worth getting a flight cancelled for. On our trip last year to New Zealand, we heard other tourists raving about Fergeburger cheeseburgers in Queenstown. CNN actually reported that Fergeburger could be the best burger on the planet. Fake news you say? We had to see for ourselves. Upon arriving in Queenstown, we spotted a line around the block at Fergeburger during pretty much all hours of the day – 9am through dinner time. Who gets a cheeseburger for breakfast? We tried to go when the line was manageable, but it never got shorter than about one city block. Finally, we gave up, got in line and weathered the storm. By the time our order came, we had been waiting for about 45 minutes, our kids had meltdowns and we had gotten sunburned on our necks. We very nearly walked out without getting our order thinking there is no way in hell that the cheeseburger can make up for that drama. Amazingly, it did and everything was worth it. I don’t know what the Kiwi’s do to their meat, but it was delicious and remains to this day the greatest cheeseburger I’ve ever consumed. Speaking of today, we have left Portland where one of the “big food” to try is Voodoo Donuts. Their tagline is, “The Magic is in the hole.” Uhhhhh, ohhh kay? If my mom didn’t read this blog, I would gladly provide my thoughts on this tagline some more. Anyway, you’ve probably heard of these guys on one of the Food Network shows as they are on there a lot. 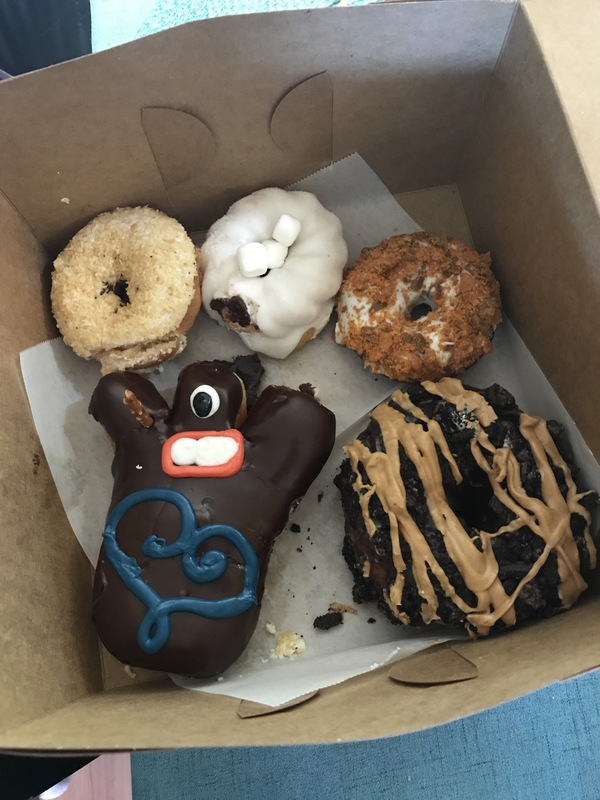 Well, apparently, Voodoo is a big deal in Portland and we sacrificed a notch or two on our belts to try a bunch of donuts so we could report back to you. While visiting one of the Portland Farmer’s Markets we started to see a bunch of people walking around with pink boxes. Using our investigative skills, we saw that the boxes were from Voodoo, so we knew we were close. Walking a couple blocks, we found the store and we also found a line of people waiting that was insanely long. You would have thought people were waiting for N’Sync reunion tickets (that would be fun wouldn’t it?) but no, just a boatload of tourists wanting donuts. Our kids were hungry and we were tired, so we nixed the line and headed to Stumptown Coffee. Now Stumptown doesn’t have any aggressive marketing, but that was a good cup of coffee! Back to our hunt for Voodoo, we drove a couple of miles to another Voodoo location that wasn’t as busy as the original. Lucky for us the line at this spot was only 10-15 mins long. With coffee in us and sedated kids, we were ready to do some donut damage. Before ordering, you get hit with Voodoo’s OUTSTANDING branding and marketing. The business is edgy and fun and really has eye catching stuff as you’ll see from the photos below. These guys know how to market. In the past, Voodoo got in trouble with the Health Dept for selling donuts glazed with Pepto Bismol (after a night on the town, why not?) and glazed with Nyquil (if you need help sleeping). Those medicinal donuts didn’t last, but the PR coverage certainly did! For another day, Gus’ and Fergburger remain champions in my food world. Then again, I’d be willing to make room at the top for the Best and Most Sophisticated Food Combination in all of Europe – a French baguette and Nutella! We’d love to hear from you. During your travels, what’s the one food or restaurant that’s worthy of the hype and their outlandish tag lines? The best one didn’t even have a hole! Sounds worth going to Ireland for! Maybe it knows the cow it came from?